Welcome to Sneak Peek, our weekly lookahead for both ends of Pennsylvania Avenue, plus my best scoops. Please encourage your friends and colleagues to sign up. Secure tips: If you have a sensitive news tip or a government document you'd like to share with me through an encrypted channel, or if you were privy to a private conversation of public interest, email me securely at jonathanvswan@protonmail.com to get my Signal number. 🌠Officially launching this Tuesday is Axios Space, your new weekly missive covering the latest in the trends, business and science of space. Axios Space Reporter Miriam Kramer will anchor this newsletter. Miriam will be joined by Science Editor Andrew Freedman and Managing Editor Alison Snyder. Because it's Donald Trump's Washington, the news arrived via Twitter at 6:02 pm ET, broken across two tweets: "Secretary of Homeland Security Kirstjen Nielsen will be leaving her position, and I would like to thank her for her service....I am pleased to announce that Kevin McAleenan, the current U.S. Customs and Border Protection Commissioner, will become Acting Secretary for @DHSgov. I have confidence that Kevin will do a great job!" Between the lines: CBS' Paula Reid reported about an hour ago that Nielsen is "expected to resign" in her meeting with Trump tonight, but Trump's ambiguous wording reflects the predictably messy end to this relationship, which was formalized in a meeting in the White House residence, according to a senior White House official. Nielsen was the one who formally resigned — but the formalities don't really matter. Trump has wanted Nielsen gone for months because he believes she's "weak" on immigration, per multiple sources with direct knowledge of the president's thinking. "The president has been right all along about the crisis on the border," said a senior White House official, characterizing Trump's thinking. "He didn't think she was getting the job done. ... He asked for her resignation and she gave it to him." "Despite our progress in reforming homeland security for a new age, I have determined that it is the right time for me to step aside," effective Sunday. "I hope that the next Secretary will have the support of Congress and the courts in fixing the laws which have impeded our ability to fully secure America’s borders and which have contributed to discord in our nation’s discourse." A source close to DHS tells Mike Allen that tonight's meeting amounted to a showdown: "Frustrations were building on both sides." "She was undercut at every turn," the source said. "She's done everything she can do. The White House is eating their own." It was the afternoon in March when the conference had to take a divisive vote on whether to renounce President Trump's circumvention of Congress to fund the wall. “Well, colleagues," McConnell said, according to two sources in the room, "all I can say is our long national nightmare is over." Don McGahn, who has kept his head down since leaving as White House counsel, shared some off-the-record thoughts on Thursday in a lunch with about 40 senior Republican Senate aides. "I spent the last couple of years getting yelled at," he said, per two sources at the lunch, held in the Capitol's Strom Thurmond room. "And you may soon read about some of the more spirited debates I had with the president." McGahn didn't explicitly mention Mueller's report, but sources in the room said they understood him to be referring to it when he said this. Why it matters: McGahn was part of key conversations Mueller's team scrutinized when determining whether Trump obstructed justice — a decision Mueller declined to make. McGahn was invited as part of a regular series of off-the-record lunches. Mitt Romney's staff served Mexican food. And while McGahn mostly praised Trump, he also hinted at the brutality of his tenure, according to sources who were there. McGahn said the president runs the White House with a "hub and spokes model," often assigning the same task to multiple people. The point, per sources in the room, is that there is no chief of staff in the usual sense. Trump doesn't trust one person as a gatekeeper, per McGahn. He dislikes intermediaries. And no member of staff is empowered because Trump is the hub and he makes the decisions; all the senior aides are spokes. McGahn said a big part of his job as White House counsel was to deregulate and rein in the "administrative state." McGahn said they looked for potential judges who wanted to reconsider the "Chevron deference," which requires the courts to defer to federal agencies' "reasonable" interpretations of ambiguous laws. McGahn said Trump's judges will spend 30–40 years unwinding the power of executive agencies. McGahn marveled to the group about what Trump can get away with. He said Trump could do something that's "180 degrees opposite" of what McGahn advised — but it somehow works. "If it was 179 degrees, it wouldn't work," McGahn said, according to the sources. He said Trump usually takes the conservative side of any given debate — but makes decisions so fast that it was important for McGahn to get to Trump quickly before he announced a decision potentially based on bad information. If Trump says something publicly, he said, it's hard to pull him back. Trump administration officials expect to announce on Monday that the State Department will designate Iran's Islamic Revolutionary Guard Corps (IRGC) as a foreign terrorist organization (FTO). The Wall Street Journal first reported this expected move — the latest in Trump's "maximum pressure" campaign against the Iranian regime. "The IRGC has a ground force of 100,000 for national defense and runs Tehran’s ballistic missile programs, according to a study by the nonpartisan Congressional Research Service." "The IRGC's Quds Force, a specialized division, has arranged weapons deliveries and advised pro-Iranian militias in Syria, Iraq and elsewhere in the Middle East." "Designating the IRGC as an FTO is both politically and economically impactful, as it deters business and builds on the existing sanctions structure against the group. The IRGC is already subject to secondary sanctions. An FTO designation will tighten the noose. "It ratchets up on the economic pressure on those who perpetuate malign activities at home and abroad." "It adds to the political stigma surrounding Iran's terrorist apparatus." "By embracing actions other administrations have not, the current administration is signaling their resolve against Iran." 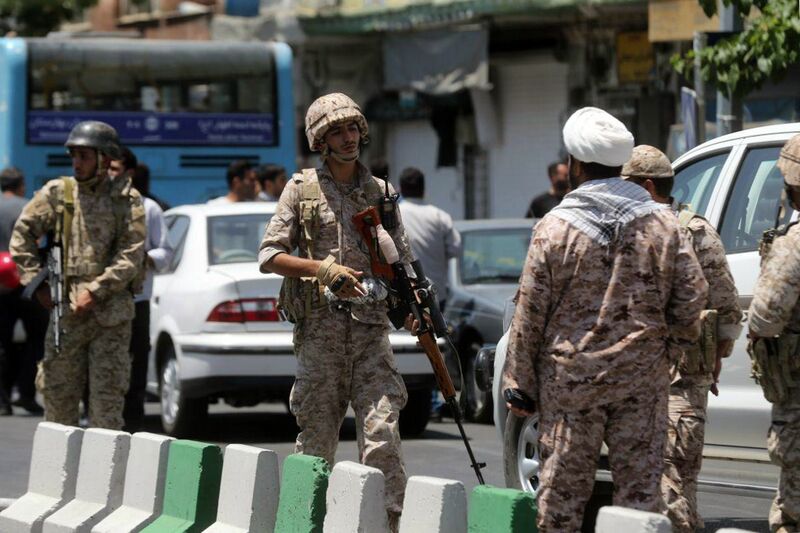 The other side, per the Journal: "Opponents of the move say it may not be decisive in weakening Iran due to the IRGC's persistent efforts to camouflage its ownership of other entities. Designating a major element of Iran’s military forces as a terrorist organization, the opponents add, also would set a precedent that ... Washington's adversaries may now draw on by applying the label to elements of U.S. armed forces." Taleblu, who supports the move, counters: "In the low-probability, high-impact chance Iran does resort to a terror or harassment attack, they would be relying on the IRGC to carry it out, thus highlighting the group's true terrorist nature." Nancy Pelosi has more power than anybody to decide whether Trump gets Congress' approval to replace the North American Free Trade Agreement with his renegotiated United States-Mexico-Canada Agreement. And the signs Republicans are seeing from the speaker are not filling them with hope. Last week, Pelosi told Politico's Jake Sherman and Anna Palmer that Mexico needed to pass labor law reforms before the House could even consider Trump's replacement to NAFTA. And now, per a source who shared the invitation with me, Pelosi has invited AFL-CIO President Richard Trumka to her speaker's meeting on Wednesday to present on the USMCA. Some Republicans close to the process are taking that as an ominous sign. Trumka "is pushing for changes and Mexico to not only pass but 'implement' labor law changes," said one of these sources. "They may be trying to slow walk this thing to death. The longer this takes, the harder it will be with 2020 Dem primary's full swing right around the corner." Pelosi spokesman Drew Hammill responded: "Our last guest was [U.S. Trade Representative Robert] Lighthizer for a similar briefing. We made clear we would be hearing from the full range of stakeholders." What to watch, per the IndyStar, on Thursday Pence promoted the USMCA to Indiana farmers who are concerned about tariffs the administration has imposed. Pence spokeswoman Alyssa Farah tells me the VP has more dates around the country lined up to sell the USMCA. "Republicans are planning a multimillion-dollar offensive aimed at fracturing the Democratic Party’s decades-long stranglehold on the Jewish vote," Politico's Alex Isenstadt scoops from Las Vegas. "Spearheading the push is the Republican Jewish Coalition, which receives substantial funding from casino mogul and GOP mega-donor Sheldon Adelson." "On Friday morning, the group's board members — many of them prominent Republican Party donors — gathered in a conference room at Adelson's Venetian resort, where they were briefed on plans for a $10 million-plus blitz geared toward attracting Jewish support for President Donald Trump. The investment, people familiar with the early discussions say, will far surpass what the group has spent in past presidential elections." "'We're at the intersection of a very unique moment in time where we have the most pro-Israel president ever in history in Donald Trump, and we also at the same time have the Democratic Party — because of the pressure of the progressive left — moving away from the traditional support for Israel that has existed going back to 1948,' said Matt Brooks, who has served as RJC executive director for nearly three decades." The House is in session Monday through Wednesday before House Democrats leave town for their policy conference in Leesburg, Virginia, per a senior House Democratic aide. The Democrats' main floor action will be a vote on net neutrality (Save the Internet Act). Several Cabinet secretaries will testify on Capitol Hill this week: Education Secretary Betsy DeVos before the House Committee on Education and Labor, EPA administrator Andrew Wheeler before Energy & Commerce, and Attorney General Bill Barr before Appropriations. Democrats plan to press Barr on the Mueller report and on the Trump Justice Department's support for a lawsuit to kill the Affordable Care Act. After this week Congress breaks for a two-week Easter recess. John Abizaid as ambassador to Saudi Arabia. Monday: Trump has lunch with Mike Pence and meets with Secretary of State Mike Pompeo. Tuesday: Trump hosts Egyptian President Abdel Fattah el-Sisi for meetings at the White House. Wednesday: Trump travels to Texas — San Antonio and Houston — for events with supporters. Thursday: President Trump and first lady Melania Trump will meet with South Korean President Moon Jae-in and first lady Kim Jung-sook. Trump is also scheduled to meet with World War II veterans. On November 10, [Paul] Ryan and Trump met face-to-face. The Speaker hosted Trump; his wife, Melania; and Mike Pence on Capitol Hill for lunch at the Capitol Hill Club, and a subsequent tour of the Capitol and the Speaker's balcony, the space off of Ryan's office. When Ryan walked into the Capitol Hill Club, Trump grabbed the Speaker's hand and brought him close in. "I think I got you figured out," Trump said to him. "That thing really rattled you." He was talking about the Access Hollywood tape. "Yeah, it really did," Ryan replied. "I get you," Trump said. "You're just a Boy Scout. You're also kind of religious, aren’t you?" "You're like Mike on that, aren't you?" Melania chimed into the conversation. "I'm a devout Catholic," Ryan said, "and yes, I take that stuff very seriously." "Oh, okay," Trump said. "You're just a Boy Scout. That's what it is."